Comment: Finally, research that delves into the complexity of this modern epidemic. Interestingly, this study emphasizes an understanding of changes in behavior and communication that identify the syndrome. Comment: Two new studies documenting the ever-increasing incidence of the childhood epidemic of our time. Comment: The overuse of antibiotics – that is the most significant difference in our food that could be leading to signs and symptoms that we now call ASD. Complementing that article is this research, Persistence of Supplemented Bifidobacterium longum subsp. infantis EVC001 in Breastfed Infants, which further explains differences the modern microbiome – and how/why breastfeeding is so important. Can Bilingualism Mitigate Set-Shifting Difficulties in Children With Autism Spectrum Disorders? Comment: As a physician who has cared for families from all over the world, I have disagreed with therapists who insist that families speak one language so as, “Not to confuse the child.” This research indicates that poly-linguilaism may actually assist communication. Comment: From the New York Times Sunday Review, bringing environmental issues to mainstream consciousness. Comment: The preponderance of gastrointestinal problems in our population of children with autism makes this intervention compelling. Comment: Use this article the next time your physician is reluctant to get chromosomal testing, or the insurance company questions the evidence. Why can’t a flu shot during pregnancy increase the risk, as well? Comment: I wrote about a promising early phase study, 5 years ago. This is a diuretic that is supposed to lower the elevated chloride levels in neurons, enabling improved GABA function. My experience was 1) Treatment did not seem to be superior to the other methylation – detox protocols that we use and 2) There were lots of side effects, and more lab tests were required. Comment: ~70% correlation between the finding of more ‘water on the brain’ on an MRI at 6 months, and the development of autism. More studies will be required to see if this observation holds up. Comment: The Republican-controlled Florida legislature, with the support of the state’s Republican governor, Rick Scott, passed the restrictions in 2011, aimed primarily at pediatricians. Under the law, doctors could lose their licenses or risk large fines for asking patients or their families about gun ownership and gun habits. Pediatricians routinely ask parents questions about safety in the home, including the safe storage of guns and precautions to prevent drowning in pools. Comment: When the FDA warns, it must be really risky. Comment: Now, MAYBE those ‘real’ doctors that are diagnosing your child with ASD will at least check Vitamin D levels. Comment: Folinic acid works on the same pathway as vitamin B12. As long as this supplement doesn’t increase stimming too much, it is definitely worth trying. Comment: The mean age of diagnosis in the two groups was 4 y.o., +/- 1 year. By that time, just about any ‘expert’ or parent knows. This tool would be most useful if the recorded measurements can be used to assess the results of therapy. Comment: Simply, there is no magic bullet for complicated conditions. Comment: From Scientific American, this confirms the advice that Dr. Udell has been delivering for many years. Comment: Great NY Times Sunday Review article. Applies to many of our patients. Comment: This is not the first time these authors pointed out this association… still not sure about cause and effect, however. Or WHY? Comment: “Many experts say that the rise in the use of all psychotropics in children of all ages derives from the scarcity of child psychiatrists.” The problem is not due to a lack of specialists, it is due to a lack of knowledge. Comment: Some doctors practice modern medicine, others are just old-fashioned. Like, for example, in ASD. Comment: From the NY Times… poop going mainstream. Comment: A possible biomarker for ASD… follow levels that relate to involvement and improvement. Comment: Another GlaxoSmithKline wonder drug. I’ll bet this isn’t the only pharmaceutical that isn’t good for kids. Comment: Is this information finally taking hold with the medical establishment? Or, is it still kooky? Comment: I disagree. The reason that there are more and more families seeking assistance for their apraxic, non-typically developing children is not simply due to a change in criteria or awareness. Comment: Chemicals could be part of the toxic soup causing ASD? What chemicals? Comment: If the information is verified, it does help explain many disorders, including autism. Comment: Great review in NY magazine. Comment: Another study demonstrating vaccine safety. Comment: Maybe, just maybe, it’s a combination? Comment: Watching a 10-minute video, ‘expert’ raters missed the diagnosis of autism 39% of the time. This is documentation why the present method of evaluation for ASD is not working. Comment: Now, they’re gonna spend $325K to see if the stuff is safe. Comment: Here we go again… instead of uncovering the real reasons for the increase, let’s blame it on the change in diagnostic criteria. Plus, we can completely ignore working on prevention and cure. Comment: NYT science article explaining research that genes that were not a problem in the ‘olden days’, are now responsible for obesity. It’s the environment, stupid. Comment: Great effort, great story. Comment: A good friend who is both radiologist and pathologist had the best response. “Those connections aren’t disappearing because they are being used… the rest of us aren’t including those pathways, so they get pruned.” He’s a really smart guy. Comment: Apps that encourage speech do not create lazy voiceboxes. Comment: 1. The article originated in Molecular Psychiatry – a very technical journal. 2. If prenatal exposure to steroids is related to later autism, why couldn’t postnatal exposure (up to 3 years) be just as risky? 3. 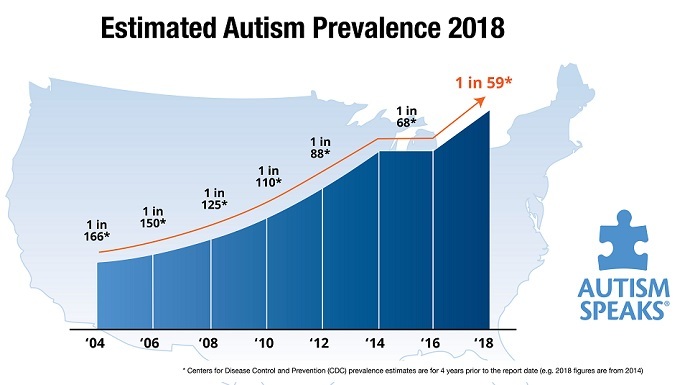 Bloomberg news (and others) reported that it “provides a possible explanation for how autism develops during pregnancy, countering fears that external factors such as vaccines play a role.” How do they know that this information has anything to do with vaccinations? How do they know if steroid use in pregnancy doesn’t increase the risk of vaccination in selected patients? The “V” word was never mentioned in the original text! Comment: An important piece of the puzzle that implicates mitochondrial function. Comment: Medications that affect the mother’s brain, affects the fetus, as well. OBGYNs and psychiatrists, take note. ncbi.nlm.nih.gov/pubmed/24655649" target="_blank" rel="noopener">The broader autism phenotype in infancy: when does it emerge? Comment: Susceptible siblings who escape autism. Comment: Pediatricians continue to over-prescribe antibiotics. Too much candy isn’t good for a baby. Comment: The program to promote vaccines is backfiring; the population is exhibiting less compliance. Maybe they are going about it the wrong way? Comment: The FDA warns that any medication taken during pregnancy may be unsafe. (Except the flu shot). Comment: After years of being asked if I really believe that our toxic environment could really be related to autism, here is some concrete information. For the disbelievers – don’t argue with me, argue with the publishers of The Lancet. Comment: If a pediatrician needs special training to diagnose ADHD, what were they doing in their residency? Comment: Mice ain’t men. Last year, we had a few families who gave this a try, no observable results, lots of worries and labs. Rigid-Compulsive Behaviors are Associated with Mixed Bowel Symptoms in Autism Spectrum Disorder. Comment: Ah… so maybe the brain bone is connected to the bowel bone? Comment: It’s official… there is more than one type of autism, and the gastrointestinal system plays a role in some types. What Does Risperidone Add to Parent Training and Stimulant for Severe Aggression in Child Attention-Deficit/Hyperactivity Disorder? Comment: Risperdone PLUS Ritalin – that ought to do the trick! A nine week trial, hormone elevations and gastrointestinal upset occurred more, and no mention of sleep or tics. But now, it’s gospel. Is the Drug Industry Developing Cures or Hyping Up Demand? Comment: My blog about this hormone here. Comment: Many are calling this an epidemic. Epidemics in humans are environmental, since it takes many eons to mutate. So, if it’s an epidemic, where do we see the possible causes? Comment: I wonder if the Wright’s (the philanthropic parents of an autistic child), who founded Autism Speaks, have been surprised at the repercussions from this blog? Comment: Interesting story from the New York Times… glad to see that something is called an ‘epidemic’. Comment: Stories such as this from the New York Times are often re-told as warnings not to use any such supplements. Comment: The authors claim that they are seeking biomarkers for early identification of infants at risk. Pediatricians, neurologists and psychiatrists are STILL telling parents of young children who already exhibit multiple red flags to wait and see. Comment: This is what I’ve been saying for years now… it ain’t your grandfather’s (or father’s) ADHD. Comment: This question comes up often, here is the latest research, though the patient population is from the previous century. Comment: If it is true of neuro-typical children, it could also be the reason that so many ASD patients seem to suffer the same fate. Comment: These guys are being too careful. This may need further study from an academic point of view, but the bottom line looks like – too much video is not good for challenged kids. Comment: “What might have been surprising had it not turned up again and again in earlier studies was that methylmercury values were beneficially associated with scores on one of the scales.” So, mercury is actually GOOD for ya! Well, at least it’s good for the 87,000 people who live in the Republic of Seychelles. Comment: This study should give some piece of mind to concerned Moms and Dads. Comment: Look at the India/worldwide statistics that this article offers… quite different from our experience in the States. Comment: “Those are astronomical numbers. I’m floored,” said Dr. William Graf, a pediatric neurologist in New Haven and a professor at the Yale School of Medicine. He’s “floored” – what rock has he been living under? Comment: So, it’s just a coincidence when children regress within weeks of getting some vaccinations. Lots of coincidences. 5% in my practice. Comment: Could this be one of the causes of the epidemic that we call ASD? The doctors who care for such patients KNOW that there is something wrong with the children’s G-I system. Comment: When the incidence – the number of new cases – of a condition increases, OF COURSE the prevalence – the total number of cases in the population – will increase. DUH. This is not news, it’s math. Comment: Can a Radical New Treatment Save Children With Severe Food Allergies? Autoimmune diseases – the plague of the 21st century. Comment: So, when you read that some therapy has “been around for years,” check out who the patients were. Comment: This is why we’ll never know WHICH of the 85,000 foreign substances are affecting our population – When it comes to drugs, less is definitely more. Comment: And, the overuse could even be harmful. Comment: Another Great NYT story about what a special person CAN do! Comment: More than 14 known adverse events, but not autism. Is that good? Comment: Really interesting point of view! Comment: Groundbreaking research shows that the differences in certain areas of the autistic brain appear related to genes turning on and off in an unusual manner, and that the autistic brain had more genes involved in the inflammatory and immune response. Hmmm… sort of what we’ve been saying for a while now. (There is a more readable version of this in Science Daily). Comment: Could it be that our children who have asthma and autism have been given too many antibiotics?? Comment: So, we don’t have to worry, ’cause the FDA is protecting us. Comment: The enemy we don’t know. Comment: Well, I guess that means that they will have to add more antibiotics. Comment: This article from Popular Science presents a fresh and poignant understanding of OUR evolution.